Abe: It’s the little ones that get you. In 2005, a little movie called BRICK boldly announced the arrival of writer/director, Rian Johnson, as a crisp, witty new voice in cinema. It also solidified its star, Joseph Gordon-Levitt, as the it indie boy of the day. Seven years later, the twosome have finally reunited and their new collaboration, LOOPER, showcases their maturity and growth, demonstrating just how far each of them have truly come. As they are quick to explain in the narrative, time travel does not exist in 2044, the year in which LOOPER takes place. It does however exist 30 years past that point. Apparently, it is near impossible to get away with murder in the last quarter of this century, so the mob sends people back in time to be shot and disposed of the moment they arrive by what are known as loopers. Gordon-Levitt plays one of these loopers and a successful one at that. Successful that is, until the day his future self is sent back to be killed but runs away before his present day version can do the job. For those of you not already in the loop, this is called closing your loop. 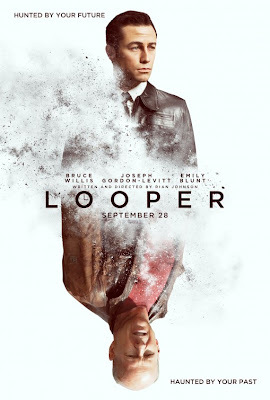 LOOPER relies heavily on this intricately woven timeline, which is only further complicated when you consider why the older version of himself (played by Bruce Willis) runs in the first place. Johnson easily handles the twists and turns he himself crafted in his near airtight screenplay and Gordon-Levitt is leading his charge. LOOPER is an exciting and ambitious project that Johnson pulls off effortlessly and with the style of master in the making. How many sheep would you give Looper? Ah! Jealous that you got to see this so early! I cant wait for this one. Good review. It’s coming soon enough! You will see it before you know it … and likely love it. Thanks!